Hazards and accidents taking place at workplace are usual but may turn into life threatening incidents. Eye injuries is a matter of concern hence we believe in right eye protection. Common eye injuries occurring at work can result from chemicals or foreign objects in the eye and cuts or scrapes on the cornea splashes burns from steam UV exposure etc. We offer all kinds of eye protective wear like googles spectacles designed for all causes of eye accidents. Our Neotherm Glass helps in protecting workers from life-threatening hazards at workplace. We offer Smelter Goggles which are fitted with Neotherm Cobalt Blue Furnace Glass and are commonly used by workers in metal smelting industry. This Smelter Spectacles has flip up adjustment fitted on stainless steel frame giving convenience to the user. Furnace Observation Goggles being light weight but sturdy offers comfort along with protection. II. It is available with flip up adjustment for user convenience screw type for mounting on helmet peak and fitted on stainless steel frame. III. It is conforming to DIN GS0196 standards. 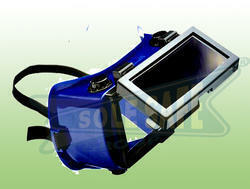 Smelter Goggles is available in customised styles and colours as per customer’s demand. Our quality management team, inspects and tests Furnace Goggles before it is dispatched to customers. 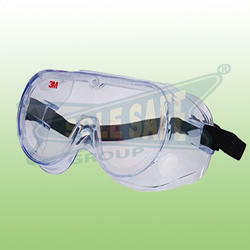 We offer extensive and comprehensive range of Safety Goggles. 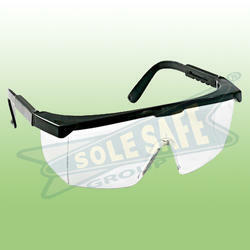 Our Industrial Safety Goggles is used in work areas which are prone to higher risk of accidents. 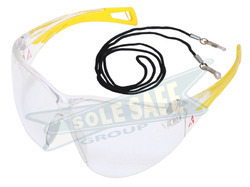 Safety Goggles With Neck String engineered specifically for protection of eyes against dust chemicals UV radiation. Moreover industrial safety glasses are supplied with neck string which is the ideal way to keep your safety glasses with you at all time. I. This is light weight spectacle which resembles sunglasses & provides long lasting comfort to the user. II. It consists of 100% Polycarbonate lens that filters out more than 99.9% of harmful UV radiation. III. It has close-fitting unitary front with dual I/O base curved lens which offers wide and unobstructed vision. IV. It is available with soft nosepiece for universal & snug fit and provided with neck string for user convenience. V. It has dual-material temples for comfortable fit. VI. It gives low energy impact resistance. 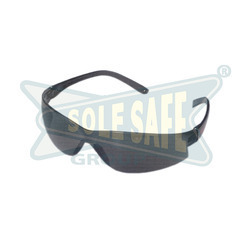 The product Protective Goggles is designed keeping in mind all innovative approaches to workforce safety and demands, made by industries worldwide. In addition, we offer varied range of Protective Glasses which are being widely used in industries like Metallurgical, Steel, Aluminium, Power, Energy, Petrochemical, Oil & Gas, Glass, Chemical, Cement Offshore & Onshore Industry, Furnace Areas, Fire Departments, etc. We are among the prestigious names in the industry, engaged in offering Chemical Protection Goggles to our valuable customers. Protective Safety Goggles used to protect eyes against threats like particulates infectious fluids or chemicals from striking the eyes. 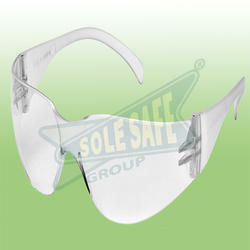 This safety goggles has polycarbonate construction with wraparound coverage with easy fit comfort and are light-weight. Now Companies have started adopting increased safety measures since it has become mandatory to follow safety protocols. Audits for Protective Eye wear take place to check their conformance to safety and quality standards set by government and testing bodies. I. Features new frameless design. II. It consists of single lens and wide coverage. III. It has light weight Dual Base & wrap around lens. IV. Stretch resistance polycarbonate lens. V. Clear inbuilt nose bridge gives comfort. To keep up with growing demand of Protective Safety Goggles, we keep adequate stocks at any given time. 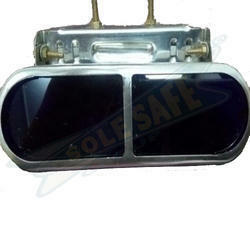 Our Safety Goggle is compact and light weight so that it occupies less space and becomes easy to transport. 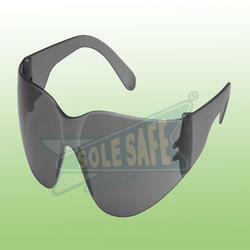 We are one of the prominent names in the industry, offering Punk Type Safety Goggles. Punk Type Goggles used to protect eyes from harsh sunlight radiations fumes and many hazardous particles. These industrial safety spectacles features with adjustable side arm and zero power lens giving comfort wearing and stylish look. I. These goggles consists of single lens with side shield for maximum coverage. II. It has nylon frame and polycarbonate lens. III. Features clear inbuilt nose bridge giving utmost comfort. IV. It consists of easily adjustable side arm for personalized fit. We offer broad selection of Punk Type Protective Goggles for construction, chemical, food service, metal, cement , marine and other industries. We study the market demand for Punk Type Safety Glasses regularly and keep optimum stock levels. We are known for creating a wide range of innovative and sustainable products for the industrial markets among which Safety Goggles stands on its design, strength and reliability. This Industrial Safety Goggles is recommended for labours, workers and inspection officers to use while performing their duties at the site. These Protective Goggles are finely finished and are known for their ability to provide optimal protection. Features clear anti-fog lens and clear frame. It has polycarbonate lens which absorbs 99.9% UV radiation. It is designed to meet the high impact requirements of ANSI Z87.1-2003. • Extremely light weight, weighing only about 26 gms, thus providing extreme comfort. • Wrap-around design for Better coverage. We have over two decades of vast industrial knowledge and experience in producing superior quality Welding Safety Goggles. The basic materials used in manufacturing Welding Goggles are well tested by our testing team to ensure its safety. Our engineers and technical team also provide customised designs ARC Welding Goggles as per customer requirements and applications. Advanced techniques are used to produce Welding Protective Goggles with precision. • It has a wide soft PVC Body which provides the wearer excellent comfort. • it is provided with Flip-up lens window to enable clear vision during those times while welding operation is not in progress. • it is provided with Six Indirect Ventilation Caps two on top, two in bottom and one each in sides. • It has a fully adjustable elastic head- Sand for a snug fit. • Comes with Lens Replaceable feature. We are the prominent manufacturer, supplier, trader, distributor and exporter of Leather Cup Goggles.These Goggles are crafted from solid steel eye plates and surrounded by leather serves as best choice for protection against dust and other unwanted particles.These safety goggles consist of side vents which allow body moisture to escape thus helping to minimize fogging with an elastic strap that accommodates nearly every head size. I. This anti-dust goggles has aluminium ring in one piece leather thus giving ventilation arrangement. II. It consists of 50 D colour glasses clear / coloured lenses which can be even replaced. III. It is commonly used for grinding gas welding furnace observation. 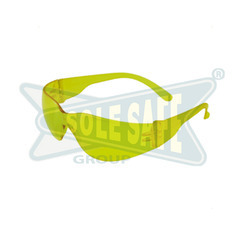 This Leather Cup Safety Goggles allows the workers to handle hazardous tasks at workplace with adequate safety. Our Bocal Goggles finds its application in industries like Power, Energy, Railways, Automobiles, Aviation, Engineering and Construction. Our product is well known for its convenience to use, high strength, lightweight and high durability.